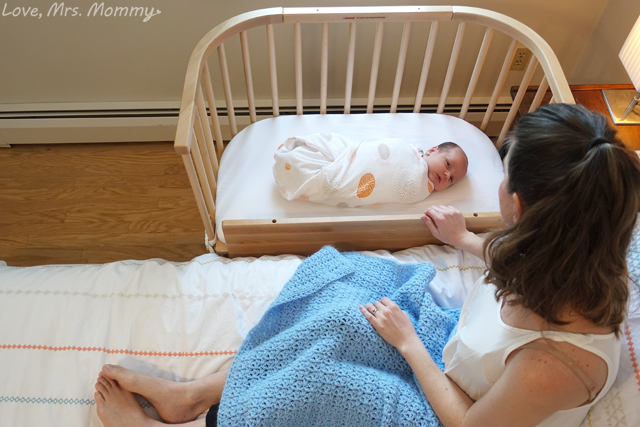 Love, Mrs. Mommy: Babybay Bedside Sleeper Is A Dream Come True For Parent & Baby! Babybay Bedside Sleeper Is A Dream Come True For Parent & Baby! I received the Babybay Beside Sleeper at no cost to facilitate this review. All opinions are my own. Hindsight is 20/20 and most of us never get the chance to have a do-over, but I actually did! After becoming a first-time mom, I realized I bought and/or received a ton of things I didn’t need and there were products I really wish I had. The item that topped my Wish List for my second baby was a bedside sleeper. And thanks to the best quality bedside sleeper company around, babybay, I had the opportunity to try one out and share my experience with all of you! 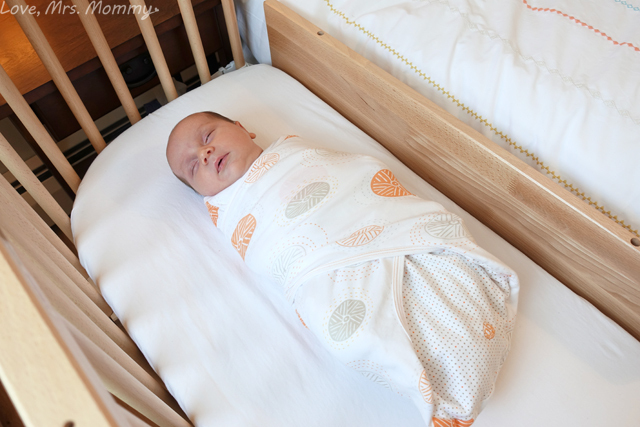 Babybay prides itself on their safe, quality products that give peace of mind to parents. Everything they create is innovative, ethically manufactured, sustainably resourced, and made of fully non-toxic components! I just love companies that go above and beyond, and babybay does just that! Their European made co-sleepers and mattress pads meet top quality standards and thanks to this, you can rest easy knowing their co-sleeper bassinet is made from sustainably sourced beechwood. And I definitely support a company that is not only aware of their impact and imprint on us directly, but also our environment and our children’s future. In fact, for every tree that they use, they plant another. Love it! There are numerous reasons why I wanted a bedside sleeper for our second baby, but there are two that are the most prominent. (You’ll read about my other reasons below) The first being that I already had a child, and I wanted to be able to tend to our new son quickly without waking our daughter up too. Oh, the parental fear!! My second reason is for making middle-of-the-night breastfeeding easier on me, hence making my postpartum recovery faster. With our son sleeping beside our bed, I would have the ability to feed him quicker and save myself from lumbering in and out of bed repeatedly in the middle of the night. Therefore, putting less strain on my body. For the birth of our son, I ended up having another c-section. I knew this was a possibility and this made for another reason why I wanted a bedside sleeper. I wanted to be prepared just in case and do what I could to make my recovery easier. Thanks to babybay, I was ready! The babybay bedside sleeper is a dream come true! It’s easy to assemble, taking only 15 minutes from start to finish and is adjustable. For greater ease of use, the bassinet can be adjusted to the height of your bed and you can attach the included safety anchor strap to your bed securing it in place. Plus, it’s beautiful! I received The Trendsetter, which is their sleeper in a light gloss finish. They have many other finishes to choose from and one will surely fit your taste and style. Babybay has a bunch of other accessories that you can purchase to go along with your bassinet. I purchased the Cooling Comfort Jersey Sheet and the Classic Comfort Mattress Pad with Cotton Cover. There are other sheet and pad options as well as; casters, conversion kits, organizer, canopy, babynests, and more! In my opinion, the quality of this beside sleeper truly is unparalleled to anything else on the market. From the safety features to the beautiful heirloom quality of the wood, it will not only serve your family, but quite possibly generations to come. 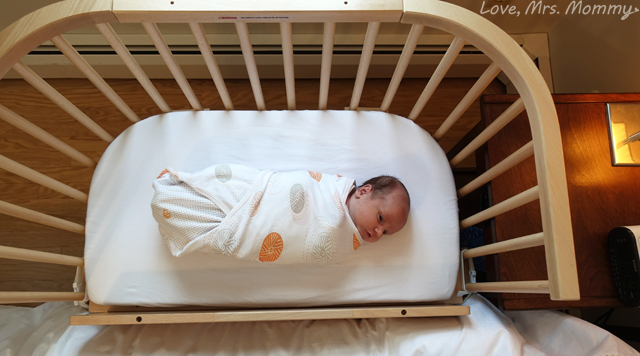 Plus, your baby will get more use out of this bassinet than other ones on the market. The babybay can hold up to 90lbs (other brands can only hold up to 30lbs), and can be used for; 6 months as a bedside sleeper, 3 years with full crib conversion and even up to 5 years as a bench! Multi-use products are genius! Now, with our son sleeping next to me, in his own safe sleeping space, I can rest easier. He’s within arm’s reach and I can take care of him much more quickly than if he were in another room. In fact, sometimes my husband doesn’t even know that our son has even cried out (for real!!). This also keeps our daughter sleeping soundly, which was just what I wanted. The last thing you want is for the whole house to wake up from the newborn. More sleep for everyone is a good thing. It makes for better rested people, which makes for happier days. No one needs a cranky toddler, an upset newborn, and walking zombie parents. 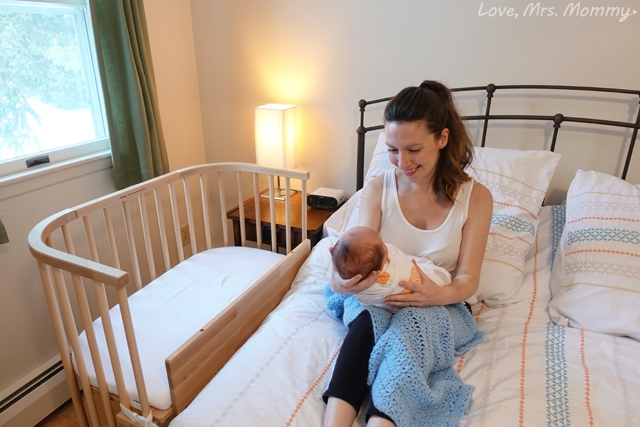 This sleeper is also just what I needed for nursing our little one without having to get up and out of bed. This saves on my aches and pains after my c-section and keeps our son happy and full much more easily all night without disturbing everyone. Sure Daddy gets up and does some diaper changes, but this way he can skip out on a few turns and get more rest. I know he loves that! One of the most beneficial aspects of the babybay bedside sleeper is the fact that it gives me peace of mind. After having two miscarriages, having my son this close by during the beginning of his life helps to alleviate my fears. He’s in a safe place and I know that with him near I will have a much better chance at being able to detect something that might be alarming. And you can’t put a price on that. Thanks babybay for thinking of us parents and what we want in a sleeper. I know I am a satisfied customer! And if you, or a loved one is in need of a bassinet, make sure to check out babybay. You’ll be happy you did! Connect: Find out more about babybay by visiting their website. Then make sure you “like” them on Facebook and follow them on Instagram. Buy It: Click here to purchase The Trendsetter babybay bedside sleeper that is featured in this review. Don’t forget to check out all their other beautiful bassinet finishes and accessories. I wish I had one of these when my kids were babies! I loved having my child near me when she was a baby! We both slept better! I love this. No more worrying, having to go to another room or even the other side of the room. Also, not safe to sleep with baby in the same bed so being right there next to you is amazing. Such a wonderful idea for moms! This looks so convenient! I'm sure it makes things easy to feed baby during the nighttime! I wish I had this for when my daughters were babies, especially during all those late night feedings. It looks like a great way to transition baby to a crib, since it looks like a crib. Oh, how I remember those days! Getting out of bed is a painful chore after a C-section. This would have been such a blessing for me. This Baby Bedside Sleeper is just a wonderful idea! I do wish I had that after my children were born. My niece is expecting and this would be perfect for her. This would make a wonderful Baby Shower gift. Great idea! I absolutely love this idea! I'll have to get one with our next baby! Having more conveniences, especially with more than one child, is a must! It’s true - moms only have 2 hands no matter how many babies she has! She also needs her arms and hands to hug her children as much as she can so she can keep the jealousy monster away! Plus I can see more restful sleep for mommy and baby! This is wonderful!! Being calm and rested helps keep mommy’s breast milk flowing. I feel that the babybay bedside sleeper is a must to help mommies accomplish all these things and maybe more!! I like the added plus that it holds up to 90lbs. of sweet baby! That's a great idea. Being so close to the baby would be very convenient. This is such a great idea! My husband and I are trying to get pregnant. If we are successful, I want this. This would be perfect for my grandbaby on the way! Oh man, I could've so used this with my youngest! Instead she just ended up in our bed & now I'm sure that's going to be an issue when she gets older. This sleeper looks to be of high quality. My next door neighor is pregnant, so I will recommend this to her for her child. This would have been perfect for my Daughter with my Grandson. He was a sick little guy and they were up and down all night. This is great, the would be a great shower gift is you went in with someone. The pictures of you and the baby are perfect. Congratulations again!. This would really come in handy for a newborn baby. I love that this is easy to assemble, that is important. It is such a convenient and perfect product for a new mom and her baby! I'm pregnant with my first baby and I would love to have something so easy. It would make me feel more comfortable and relaxed to keep baby so close. Congratulations!! and I love that you are able to take down one side at ease to help with taking care of the baby. Congrats! I really love this. So unique! This is really fantastic for mom and baby. Now I know what to get my sister for her baby shower. Thanks. This looks amazing. I wish they had something like this when I had my babies. This is so nice to read. I have a neighbor who is expecting.I will forward this information to her. Great info for a soon to be mom! What a great product! I love that it can be used in different ways as your child grows. It's also nice that there are so many accessories you can get to go with it.